President Obama's job approval among the public hit a big milestone last month, as he wound up with a monthly average of exactly 50 percent. Half the public approves of the job he's doing, to put this another way. 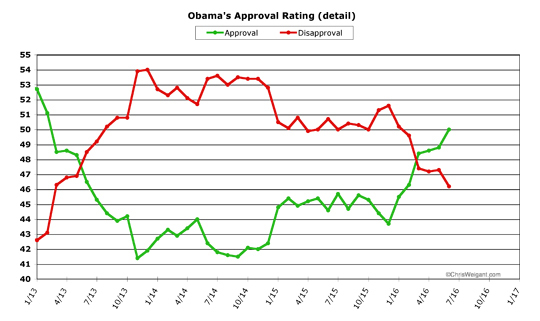 This was a rather dramatic improvement over Obama's rather flat May numbers. Let's take a look at the new chart, where his improvement is pretty easy to see. Obama's improvement in his monthly average job approval numbers had slowed somewhat in April and May, but the trend steepened in June. His average jumped 1.2 percent last month, to finish at the round figure of 50.0 percent. His average monthly disapproval fell by a roughly equal amount (1.1 percent) to wind up at 46.2 percent. The past six months has been the longest winning streak Obama has had during his entire presidency, in fact (more on this in a bit), and he has now regained all the ground he lost since his "second honeymoon" period. His numbers are now 3.8 percent "above water," which is a comfortable margin considering that two years ago he was 11.0 percent "below water." By just about every metric, Obama has been doing great ever since the presidential contest really got underway at the start of this year. At the start of June, the primary phase of the election drew to a close. Hillary Clinton finally topped the magic number of delegates to secure the Democratic nomination, and Donald Trump kept spouting gaffes, effectively blowing an early chance to define Clinton (rather than further negatively define himself) in the eyes of the public. The list of prominent Republicans who said they either could not support their own party's presidential candidate or (even worse) would be voting for Hillary Clinton seemed to grow longer each day. All in all, it was a pretty good month for Democrats out on the campaign trail. President Obama didn't himself join in the campaigning yet -- in fact, as I write this he is probably making his first such appearance, at a Hillary rally in North Carolina. So campaigning didn't have anything to do with Obama's poll improvement in June, but it may have a direct influence in July. Clinton got one piece of good news during June (and one more today, obviously), as Trey Gowdy wrapped up the final (hopefully!) Benghazi investigation and announced that Americans had spent $7 million on a giant nothingburger. No new revelations, no scandal at all was laid at the feet of Clinton. But this likely didn't influence Obama's polling at all. Mid-month we had the tragedy in Orlando, which spurred a surprisingly intense Democratic reaction in Congress. Rather than fight a wide-ranging battle over gun control, Democrats focused on just two pieces of legislation that both enjoy over 85 percent support from the public. This was pretty smart politics, and things got rather dramatic in the Senate with the ninth-longest filibuster in history -- which was then topped by a 26-hour "sit-in" in the House. Both are going to result in votes, but nothing is actually going to pass. Still, this was excellent political theater from the Democrats, much more focused and effective than anything they've tried in a long time. Britain dominated the news for about a week as many hands were wrung over their "Brexit." While an enormous story across the pond, however, this will fade from America's consciousness fairly soon (that's my guess, at any rate). The end of June is always "big Supreme Court decision season," and this year saw a lot of liberal victories and only a few temporary setbacks. The big case that went conservatives' way was a 4-4 split, meaning it'll likely be back again next year (when, hopefully, there will be another liberal justice on the bench). All around, though, there were few political news cycles in June that directly involved President Obama. Meaning what moved his numbers upwards was likely a general feeling about the ongoing election. The more people look at Trump, the more they like Obama, in a nutshell. I was cautiously optimistic last month, predicting that: "I could even see him topping the significant 50 percent barrier within a few months, although this likely won't happen next month (maybe in July or August, after the convention)." Obama did, impressively, beat my expectations and hit the significant 50.0 percent goal. This puts him in better shape than he's been since February of 2013 -- the month after his second inauguration. To see the movement more clearly, here is an exploded view of Obama's entire second term. Obama's rise in job approval since last December is nothing short of stunning -- gaining 6.3 percent over a six-month period with no downturns at all. In fact, this is the longest streak of monthly gains in job approval Obama has had during his entire time in office (the closest he ever previously came was when he rose steadily for five months during his re-election). Obama seems to have snapped out of the doldrums he hit in spring, too. In both April and May he only managed to improve 0.2 percent per month, but this month alone he rose 1.2 points. When you look within the June data, the trendline all month long is strong, with one caveat. Obama's daily job approval started the month at 48.9 percent, jumped the next day to 49.4 percent, and then rose steadily to hit a high of 51.2 percent towards the end of the month. Obama's job disapproval numbers mirrored this trend, starting at 47.5 percent and then dipping to 45.0 percent towards the end of June. 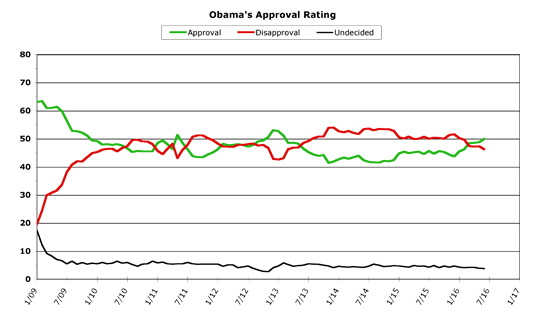 Obama hasn't been above 51 percent approval since the first few weeks after his second inauguration, in fact. But there's a worrisome counter-trend which may be developing. In that previous paragraph the key phrase was "towards the end of the month." Obama's daily average sank rather fast in the final three days of the month, winding up at 50.1 percent approval and 45.9 percent disapproval. This could indicate a flattening of the trend next month, with either a very slight uptick or a very slight slide back. Now, I don't think that the 50 percent mark is going to be a ceiling for Obama -- I think by the election he'll be higher than that. But it could wind up being a plateau for a few months. I'm seriously doubtful Obama can match his big gains in June, to put this another way. He could surprise me again, especially if the news media start covering him on Hillary's campaign trail. But the safe bet is for a fairly flat July. Of course, Obama may wind up getting a boost in August, as the Democratic National Convention will be held the last week in July. But that's looking further over the horizon than normal, so we'll leave that speculation for next month. One final historical note for June is necessary, though. I've been speculating for months now how Obama's final year in office will shape up compared to other two-term presidents. Obama will never hit Bill Clinton's heights, but then again he will not plumb George W. Bush's depths, either (Clinton was at 59.1 percent approval at this point, Bush was at 27.8 percent and wouldn't rise above 30 percent for the rest of his term). 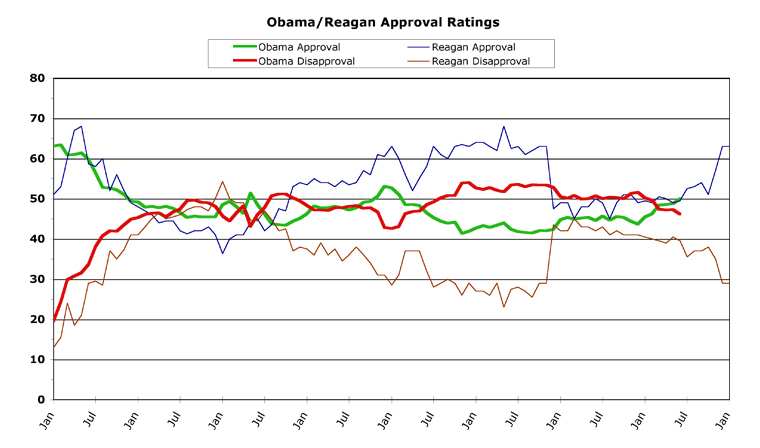 Ronald Reagan was at 49.5 percent at this point in his second term. Obama's got him beat by half a point. However, Reagan rose sharply for the rest of the year and finished up at an impressive 63.0 percent. Barack Obama is likely not going to be able to match those numbers, even if he does get a warm fuzzy feeling during the lame duck period. Still, at this point in their respective terms in office, Obama's doing better than Reagan did -- food for thought indeed. Glad his numbers are up and hope they go higher! The President has always ha good numbers. 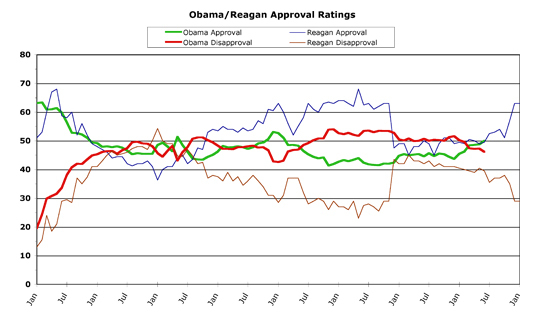 So, with that quip, are we to assume that you think Obama's numbers have always been higher than deserved? But there's a worrisome counter-trend which may be developing. In that previous paragraph the key phrase was "towards the end of the month." Obama's daily average sank rather fast in the final three days of the month, winding up at 50.1 percent approval and 45.9 percent disapproval. This could indicate a flattening of the trend next month, with either a very slight uptick or a very slight slide back. Actually, the "worrisome" trend has continued..
His spread now is at +3.1 and falling.. Anyway, looks like this comment thread is paying the price for me not posting a re-run yesterday (the barbeque called, I answered, the post got forgotten... mea culpa!). Have we ever been above 300 before?? I stand corrected... I had thought several commentaries in the last year had broke 300..
Friday Talking Points  -- Fighting Or Following? I found one FTP that had FOUR comments!?? Wha??? Was I in a coma or something??? define "good numbers." the president's approval ratings since halfway through his first year in office have been absolutely average - approval and disapproval have been nearly equal for seven years. Good news geeks! Presidential polls at the state level are starting to pick up, and it's possible to make some meaningful comparisons between 2012 and 2016 now that we have two presumptives in the blocks. By the way, Nate Silver has updated his methods section. It's worth a read. Across the board, 2016 looks better for Clinton's chances against Trump than Obama's chances looked against Romney. The aggregate predictors FiveThirtyEight and PredictWise both indicate Clinton is a strong favorite, with something in the vicinity of a 75% chance of winning the election (it shifts a few % on any given day). Both see the traditional swing states as more strongly tilted towards the Democratic candidate this cycle, although there is some disagreement on the details. Predictwise sees only one "toss-up" state, NC, all the other purples lean fairly heavily in Clinton's favor. Fivethirtyeight calls AZ almost dead even, the traditional swing states lean towards Clinton. Neither outfit sees Ohio as all that close this cycle (unless you think 68%:32% is close). FiveThirtyEight sees the most likely outcome as something close to 350 electoral votes for Clinton. That said, the Electoral Vote distribution tails are broad. Betfair (which no longer blocking Americans) agrees pretty closely with FiveThirtyEight and Predictwise, giving a 75% chance for Clinton. Trump gets better news from PredictIt, 67%:33% Clinton:Trump, Clinton down 1% on the day. I love the smell of statistics in the morning...napalm being frowned upon in my neighborhood. i'm all for statistics, but betting odds? this election is not something i'd risk money on. Watch his numbers go down again after today's announcement on Afghanistan. I suppose we are to believe that 8400 US troops can achieve in this God-forsaken "country" what 100,000 US troops could not. Wasn't he the guy who predicted there was only a 5% chance that Trump would be the GOP nominee??? All of which were COMPLETELY and UTTERLY wrong about so many things..
And we should listen to them now, exactly why??? "I'm in love with you, Billy. I just fell in love with you.."
And, speaking of cynicism - the healthy dose kind - did anyone see former UK Prime Minister Tony Blair today comment on the long anticipated (that was a little joke) report of the Chilcot Inquiry into the Iraq war? He takes full responsibility and apologizes, profusely. Well, he apologized. What he didn't do was admit that the world, in general, and the Middle East, in particular, would be far better off today if the US-led invasion of Iraq had not happened. He has convinced himself that it was the right thing to do to rid Iraq of Saddam Hussein. I guess that is what allows him to get some sleep at night. I hear your! I wouldn't put any money on this election either. Most of the punters who do are suckers, but there are plenty of them. A few very sharp traders can probably make money off the fish, and the house always wins. There may be some sophisticated players who have sound financial reasons to hedge on an election outcome, but it can't be many because the amount of money invested is relatively small, in the millions of dollars. I suspect campaign contributions are a better investment if you catch my drift. Regardless, the markets are historically good indicators, at least as good as polls early in an election cycle. Plus, they tend to respond to news events fairly quickly. Considering how utterly and COMPLETELY wrong the betting markets were on TRUMP and BREXIT... Why waste yer money??? The other BIG news is that the FBI finished its investigation of Hillary Clinton and her e-mails, and there will be NO criminal indictment of either her or her staff at all. Nor will there be any mass resignations by any of the investigators. I might also point out that the current head of the FBI, is both a conservative Republican and an appointee by former President Bush that Obama kept in the job, and who just only one month ago was getting lavish praise from Republican Officials. I assume Michale that unlike House Republicans, who are going to continue wasting money on meaningless investigations trying to get the (political) outcome that they want regardless of the actual facts, like they did with Benghazi, you will honor the agreement we all made and accept the results. Well, John, Michale accepts the results but, he is confused. By the way, check out the comments section of the last FTP column where FBI Director Comey's recommendations are being discussed. We're trying to get the comment total up to 420 ... in a legitimate fashion! The other BIG news is that the FBI finished its investigation of Hillary Clinton and her e-mails, and there will be NO criminal indictment of either her or her staff at all. "Ya gotta admire him.. Latest news, up to the minute.."
If Clinton wins, then Obama will enjoy a "third-term" surge in approval ratings. One point of geek stickler-ing. You're using "percent" when you should be using "percentage point" or just "point," as in Obama experienced a 0.2 point increase. You get this correct once, but misuse this a couple of times. To see the difference (for the non-stats commenters): If we start at 50 percent and then go to 52 percent, that's a 2-point increase but a 4-percent increase. The accepted abbreviation is "pp" for percentage points. "Well, John, Michale accepts the results but, he is confused." I think, Michale, you are the one who better get used to saying President Clinton, rather than the rest of us saying President Trump. 1.) Hillary Clinton chooses Elizabeth Warren as he running mate. 2.) Donald Trump is the one who ends up having to deal with a criminal indictment regarding his "University." Which is exactly why Clinton WON'T win.. Because over 70% of Americans don't WANT an Obama third term..
You keep saying that.. :D You might actually start believing it after a while..
Clinton is the ESTABLISHMENT candidate.. The *VAST* majority of Americans are ANTI-ESTABLISHMENT..
No matter how much it hurts, do the math..
Donald Trump is the one who ends up having to deal with a criminal indictment regarding his "University." Absolute and 1000% surety of obtaining a conviction.. Both selections have the very real possibility of upstaging the candidates..
What the hell is going on, Michale!? Careful, he could be a follower of ancient Egyptian religion. Well, looks like I was wrong too, forgot we'd broken 300 previously. It's almost time for my "Electoral Math" column series! Woo hoo! My favorite state poll site (electoral-vote.com) has a moratorium on providing data until the conventions, though, so I haven't been following it yet, I have to admit. Whaddya think about the certainty of the second female British PM? Gotta be better than the first, right? What LizM said, in . 420? Really? OK, now you've got my attention. I always respect people who are more pedantic than myself, mostly because it is so hard to do, at times. Heh. Yeah, you are right. I too cringe when this is misused in a general way. "It used to be $40, now it is $80 -- a 200% increase!" Well, no, it's a 100% increase. It is 200% of the original figure. There's a difference. I do get it. But in these articles, I play a little fast and loose, mostly because I never actually talk about "percent increase" in the technical sense. I never say, for instance, "Obama went from 40 to 50 percent approval, an overall 25% increase." I NEVER use it comparitavely, therefore I give myself license to use "percent" as an absolute -- "percentage points of Obama's total poll rating" rather than EVER use it as "percent improvement" or "percent decline." If I ever did make such comparisons, I would be a lot more accurate in the difference between "percent" and "percentage point," I assure you. But as it is, my perverse editorial insistence on spelling out "percent" instead of using "%" means that it would be pedantically long-winded to use "percentage point" (or even "point") every time I discuss changes in the polls. In the spirit of true Flying Spaghetti Monster penance, though, I accept 100 lashes with a wet noodle. On an unrelated point, I agree with your first comment. 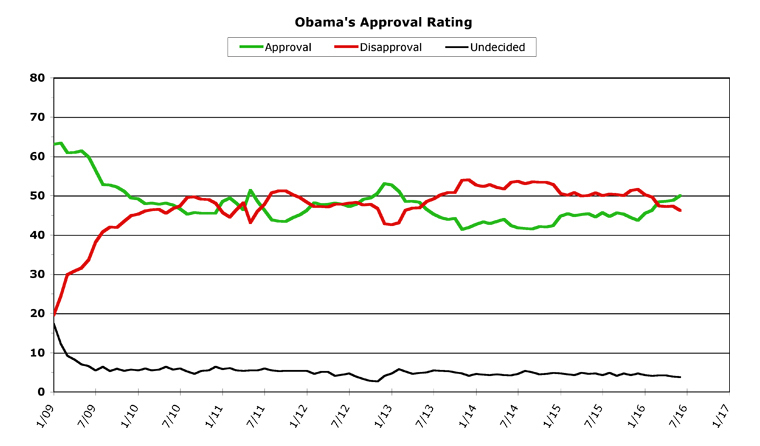 Any guesses as to how high Obama's approval will hit in his final 3 months if Hillary wins his "third term"? 55? 60? Higher? Do tell! When is Michale ever NOT confused? Interesting comment. You an Earnst fan? I think Trump might do a lot of good for his campaign by picking her, but then I just heard the idea a few days ago myself, I might feel differently once I ponder the idea for a while. Betfair is admitting Yank IP addresses again. I noticed this about a week ago. I'm not sure why they the blocked the US in the first place, or why they opened the gate again, but it saves me a few steps when I decide to check in.